Size: 4.9" x 2.8" x 0.65"
The TI-1650 and its sibblings TI-1600, TI-1680 were very flat calculators compared to the previous TI-1200 models. Only one year in front of the first pocket-sized LCD-calculators you could carry them in your shirt. Dismantling the TI-1600 or one of its sibbling is difficult, three small plastic locks have to be bent together in different directions. The technology behind the TI-1650 is similar to the TI-1265, instead of the normal 9V battery a very flat (custom made by french company SAFT) rechargable battery is used. 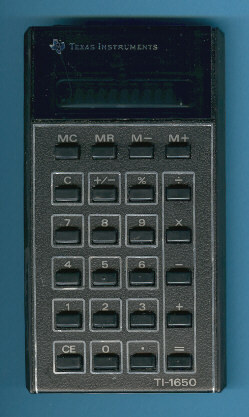 Sales figures kept low, soon after the TI-1650 the first LCD-calculators appeared on the market.